Our wish is to share the artistic wealth of this historic home. Midwest hospitality and modern amenities are priorities for our guests comfort. We continually strive in efforts to preserve this home so guests may enjoy its beauty for many years to come.  Gerald and Gloria Hilton, owners since 1998. Move mouse pointer over the small images for larger version. I cant image HEAVEN could be any better! Heaven in Cambridge, Nebraska, Yes, Yes!! The House and its Keepers are a NATIONAL TREASURE!! its in my hometown, Cambridge, Nebraska! This is THE BEST!!! After nine days of traveling to carefully chosen B&Bs from Wisconsin to Colorado, I vote you #1 with your genuine warmth and attention to detail your Inn is the one I would most like to return to. We have visited 50 bed & breakfasts throughout the U.S.the Cambridge B&B has to be in the top 5the house is so well cared for and decorated. The hospitality is wonderful and the food is excellent. We enjoyed a delightfully relaxing visit and will return in the future. We appreciate all the work you have done to preserve and enrich this excellent house. Cambridge and Nebraska can be very proud of a lodging like this. We will make every effort to make others aware of its merits and availability for a superb stay. Thank you for an enjoyable visit in your beautiful home! The food is excellent and accommodations so nice and you both are excellent hosts. We think you have established a new class of accommodationssomething like Ten Star. We have visited five continents and have crisscrossed our beautiful country many times and this was our first experience staying at a B&B. We would be tempted to give up hotel/motels forever after your warmth and hospitality and beautiful home. In response to many tour requests, the owners host a Living History tour experience. You will learn about the Falings, life in rural Nebraska, experience the beautiful interior design, and learn about Neoclassical architecture. This tour appeals to all ages and can accommodate groups up to 20 at a time. Student groups are welcome. Special events like high tea, dessert, or an ice cream social can be added for groups over 10. Unfortunately, handicapped access is not available. Please contact us in advance for availability. William H. Faling, was born in Jefferson County, New York in 1848. He was raised on a farm and engaged in farming in his early years, retail ventures in Illinois, Minnesota and Exeter, Nebraska followed. 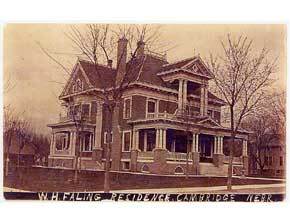 Mr. Faling and his wife, Anna (Stewart) Faling arrived in Cambridge in 1880 and opened The Regulator, a fine general merchandise store with an inventory valued at $8,000. Later that year, Anna was appointed lot agent for the B & M Railroad and William was appointed Land Agent for the Lincoln Land Company. In 1885, with the required 200 residents, he helped incorporate Cambridge and became its first Mayor. As Mayor and Land Agent, Faling laid out and platted five additions and subdivisions and sold all the lots. The next year he opened the Faling Home Bank. In 1887 he was named the first President of Enterprise Building and Loan Association. From the very beginning, the Falings labored unceasingly for the general welfare of the community. Their presence in developing many businesses and organizations exemplifies a pioneering spirit, vision, and commitment best described in a statement commending them for working together to build a thriving community out of the Great American Desert. In September of 1999, a presentation was made to the Nebraska State Historical Society Preservation Board for placement on the National Register of Historic Places. With approval of this Board, the case was then forwarded to National Committee. Notification of the approval came in December of 1999. The following description of the home details the significance of the architectural attributes. The house is three stories, plus attic and full basement and dominates the street corner of Parker and historical Highway 6 & 34. The architect designed the Faling home in the Neoclassical style with a full height entry divided by a lower full-width porch, standing with many Ionic columns. This is somewhat unusual in that no colossal columns are used for a full height entry; instead a second tier of columns occurs above the lower porch. These columns are Corinthian in style. Columns also occur on the now enclosed south porch, and on the south wall of the building are Ionic pilasters running from the first floor to the second. The eaves around the home are decorated with box dentils and a running ornamental border. The front door is oak surrounded by an elliptical arch and sidelights, decorated with leaded beveled Austrian glass. The entry hall and main staircase still bear the original finishes a faux design resembling marble. Original Faux designs also appear in the dining room, front and back hall ceiling and the second floor, Master Bedroom boasts faux painted birds-eye maple woodwork throughout. The preserved designs as well as some, which have deteriorated were the works of Danish artist, Charles Hansen and James Willer of Fairbury, NE. The woodwork in the home has been well preserved. Oak is used extensively and interior columns and border repeat the exterior designs. The fine craftsmanship is especially evident in the living room fireplace called Surround; also the main staircase (signed by the craftsman), and the dining room sideboard, which appears to be made of Italian olivewood. Leaded beveled glass is used throughout and the rose tree of life stained glass window on the main staircase is the focal point of both the downstairs reception hall and the upstairs balcony. The house retains a high degree of historic integrity and an excellent example of early 20th century architecture. The home was constructed from 1907 - 1910 under the direction of renowned architect, W. F. Gernandt. Other significant buildings noted to his credit throughout Nebraska include the historic Coleman House in Diller, the Webster County Courthouse, the Pawnee County Courthouse, and Valley County Courthouse. Cambridge had no electricity at the time, however, it was available near the end of completion of the house and wiring and electric lighting were installed. Those original lighting fixtures still hang in the present home. The huge structure of 2200 square feet per floor (three plus basement) would have been a monumental task without electrical and modern building equipment access, however Mr. Gernandt brought superior craftsmen and the finest building materials to the site. Artists, Charles F. Hansen and James F. Willer, were born in Denmark in 1868 and 1886, respectively. Seeking a more prosperous life, they came to America, then made their way west. While visiting in Southeast Nebraska, Hansen saw a great potential for profitable work as many new buildings were being built. Willer, after arriving in New York Oct. 16, 1907, joined his partner in Fairbury, NE where they established their storefront Hansen & Willer, the painters and decorators. Gerald and Gloria Hilton are fourth generation, life long residents of the Cambridge area. Gerald spent six years in the U.S. Air Force as a pilot and returned to the family farm in l957. He continues his interest in flying and has flown 23 different aircraft in his 40 years of flying. He participates in many facets of Cambridge and the area through involvement in Boards and organizations. Gloria is a dedicated volunteer and promoter. Her interests have focused around music and the arts. She lead a project beginning in 1967 to document and celebrate local history, which resulted in publishing the Cambridge Centennial History Book  1874 to 1974. The Hiltons ownership of the Wm. H. Faling historic home inspires the researching, restoration, and development of this landmark home and welcomes visitors in excess of 1800 persons annually. Some of these are Bed and Breakfast guests, however, the majority stop by to see the amazing architectural features. The Hiltons find great pleasure in making these acquaintances and sharing the many unique offerings of the Cambridge area. Cambridge is unique as a small, agricultural-based community in its many recreational facilities, beautiful homes, fine businesses, and diverse and progressive citizens. Our wish is to share the artistic wealth of this historic home. Midwest hospitality and modern amenities are priorities for our guests comfort. We continually strive in efforts to preserve this home so guests may enjoy its beauty for many years to come. Gerald and Gloria Hilton, owners since 1998.